The 70-room Comfort Suites UCF/Research Park is located at the entrance to the Central Florida Research and is one mile from the University of Central Florida. The three-story, non-smoking hotel is designed for the business traveler but its facilities are equally suited to families on vacation. Items included with the room rate are a hot breakfast buffet, high-speed Internet access, local telephone calls, parking and coffee available in the lobby 24/7. There are meeting facilities available that can accommodate 40 guests. The property is 10 miles from downtown Orlando. Area landmarks and attractions include Walt Disney World, Sea World, Wet n Wild water park, the Islands of Adventure amusement park, Universal Studios and the City Walk entertainment complex, the Orlando Convention Center, Sea World, the Florida Citrus Bowl, Amway Arena, home of the Orlando Magic basketball team and shopping at the Prime Outlet Shopping Mall and Fashion Square Mall. All of the suites have a work area with Internet access, microwave oven, refrigerator, coffee maker, remote control television with cable news and movie channels, pay-per-view movies, clock radio, sleeper sofa, telephone with voicemail, iron and ironing board and a hairdryer. Some rooms have a whirlpool bath. Handicap accessible rooms are available. This hotel has an outdoor swimming pool and a fitness center. The complimentary breakfast is the only meal served here. Restaurants nearby include a TGI Fridays, Longhorn Steakhouse, Applebees, Tony Romas barbecue, Don Pablos and the Hops Brewery. 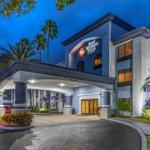 The 24-hour front desk has safe deposit boxes and information on the Orlando attractions and events. Other amenities include a guest laundry, games room, copy and fax machines available for guest use and ice and vending machines.